Custom Thick Foam Koozies - Foam Can Coolers, Personalized in Bulk. Promotional, Inexpensive, Best in America. Free Wraparound Print. 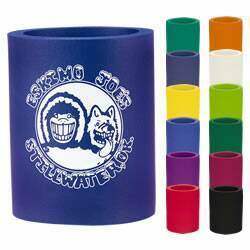 Sturdy wholesale can holders in many colors and customized on both sides. The thick foam (3/8 in. thick) can holder -koozie maintains your beverage can at 40-degrees or below for 35 minutes, or three times longer than a can without a Koozie. Made of Polyurethane Foam with A No Slip Grip. Budget Prices in the USA and Canada for customized foam koozies. American clients pay no taxes. Free artwork design. We will send you a proof for your approval before production.